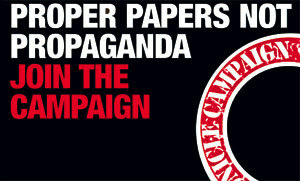 The Fulham and Hammersmith Chronicle has launched a campaign for “Proper Papers Not Propaganda” - attacking H&F News - the Conservative run Council’s tax-payer funded propaganda sheet. H&F Labour have long campaigned against the Council's propaganda paper and pledge to dispose of it in our manifesto. We will also cut council advertising; reduce the press office to a minimum and in doing so save £5million. The Chronicle is joining a long line of those that are appalled by the tax-payer funded propaganda in our borough. Last October, Parliamentarians of all parties attacked it at a Select Committee; last August, the Evening Standard published a withering exposé; and this local website has run a long standing campaign. Even the Tax Payers Alliance told H&F’s Conservatives to “hang their heads in shame”. You can support the Chronicle’s campaign by signing their petition here.